Are you counting the days until spring break? For relief, head about a block south from Salt Lake Community College’s Taylorsville Redwood Campus on Redwood Road to Moki’s Hawaiian Grill. 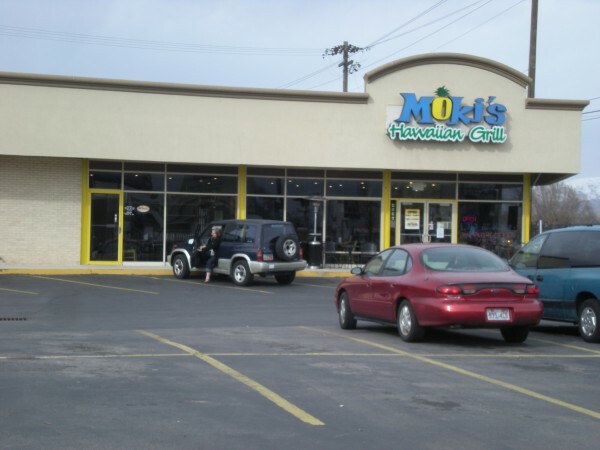 Moki’s is a family-friendly restaurant located at 4836 South Redwood Road. Owner Masa Tukuafu came with his family to Utah from Tonga in 1970. He didn’t learn to speak English until he was ten years old and said it was hard to make friends here in Salt Lake City. Later on in his life he attended school at the University of Utah. After operating a Jamba Juice franchise in Arizona, he opened Moki’s six years ago and continues to have success. Today he owns two Moki’s restaurants one in Mesa, Arizona and one here in Taylorsville, Utah. Tukuafu decided to name the restaurant after a Hawaiian tree (Mokihana) that produces many items for the local natives. Tukuafu wanted to start a Hawaiian restaurant that had a healthier menu and had quality meats and salads. Their sauces are made from scratch each day. He said that this is the secret to a great dish. Moki’s is decorated to look like a Hawaiian surf shop inside. There is an assortment of surf boards, grass skirts and coconut shells to give customers the feeling of being in paradise. The walls are painted to give the feeling of being on the beach, relaxing in the sun and breeze. When my guest and I visited we were greeted with a huge smile and “Aloha.” The staff is very helpful in describing the different dishes. For appetizers, we tried the coconut shrimp and it was very good. The shrimp is lightly breaded with coconut and it comes with cocktail sauce. We have always enjoyed the Teriyaki Chicken when we go there. The chicken is so moist and tender and is marinated to perfection. When you take a bite, you can see just how deep the marinated sauce has seeped into the chicken. It’s so incredible. The Chicken Katsu is really good as well. It is a lightly-breaded and deep-fried chicken breast that comes with a very good tangy sauce that will awaken your senses. It has a little bit of a kick to it and is similar to sweet and sour chicken. Another dish that we enjoyed was the Orange Chicken. It also is a lightly-breaded and deep-fried chicken that comes in a wonderful orange sauce. The tasty orange sauce was great to add to the Hawaiian rice. During one of our visits, we tried the “Fish of the Day,” which was Mahi Mahi. The fish was cooked just right. It was so tender that it fell apart and the seasonings were incredible. I believe the seasonings were onion, garlic, lemon and pepper. It came with a tartar sauce that was mild and very flavorful. We love the Hawaiian Salad at Moki’s. This salad comes with almonds, cabbage, oriental noodles, chicken and Moki’s dressing. It is similar to a coleslaw, but it is very good and unique. We usually order a plate that comes with the choice of brown or white rice. We prefer the brown rice. It has a better flavor and a hearty texture. I’ll have to admit that I love a good dessert. When you go to Moki’s , you have to try their Grandmas Caramel Chocolate Cake. It really is to die for. My wife and I have had a good discussion about whether it is a cake or an English-style pudding because it is so smooth. The richness of the chocolate cake is added with the caramel, toffee, whipped cream, macadamia nuts, and a side of ice cream. You’ll think that you’ve gone to heaven after eating this dessert. The average cost of a plate ranges from, $5.50 to $9.00. Their hours of operation are 10:30 a.m. to 9:00 p.m. Monday through Thursday and 10:30 a.m. to 9:30 p.m. Friday and Saturday. Moki’s is closed to the public on Sundays.